Arlington, Va. - October 16, 2014 - PBS Distribution announced today it is releasing Bing Crosby - Rediscovered from American Masters on DVD December 2. Bing Crosby (May 3, 1903-October 14, 1977) was, without doubt, the most popular and influential multi-media star of the first half of the 20th century. For more than three decades, through radio, film, television and records, he reigned supreme. Thirty-seven years after his death, he remains the most recorded performer in history with nearly 400 hit singles, an achievement no one - not Sinatra, Elvis or the Beatles - has come close to matching. A brilliant entrepreneur, Crosby played an important role in the development of the postwar recording industry. As one of Hollywood's most popular actors, he won the Oscar for 1944's Going My Way and starred in the iconic "Road" films with Bob Hope. Bing Crosby - Rediscovered explores the legend of an iconic performer, revealing a personality far more complex than the public persona he so carefully cultivated. 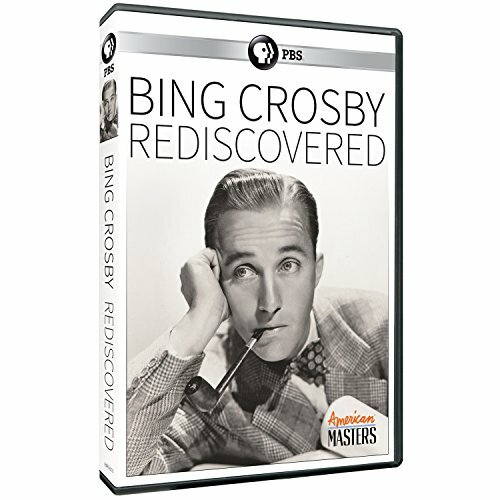 Bing Crosby - Rediscovered will be available on DVD December 2, 2014, the same day as the national PBS premiere (check local listings). The run time of the documentary is approximately 90 minutes, and the DVD SRP is $24.99. Crosby's estate, HLC Properties, Ltd., granted American Masters unprecedented access to the entertainer's personal and professional archives, including never-before-seen home movies, Dictabelt recordings, photos and more. Narrated by Stanley Tucci, the film features new interviews with all surviving members of Bing Crosby's immediate family - wife Kathryn, daughter Mary and sons Harry and Nathaniel - as well as singers Tony Bennett and Michael Feinstein, record producer Ken Barnes, biographer Gary Giddins and writers Buz Kohan and Larry Grossman. "Bing's remarkable appeal, which continues to this day, was in his seemingly effortless ability to pull an audience in to his intimate, laid-back voice," says Emmy-winning director Robert Trachtenberg, whose past films for American Masters include Mel Brooks: Make a Noise, On Cukor, Gene Kelly: Anatomy of a Dancer and Cary Grant: A Class Apart. "With the new material I've found, I think the breadth, depth and candor of his story will hopefully allow people to see him in a new light." "Much like his talent, Bing Crosby is a natural for the series. With more No. 1 recordings than anyone, it is easy to overlook all of his other achievements. Thankfully, this film delves deeply into all of his remarkable work, and will surprise many viewers with a unique perspective on his private life," says Michael Kantor, executive producer of American Masters. A companion soundtrack including many previously unreleased recordings heard in the American Masters film will be available this fall. Launched in 1986 by series creator Susan Lacy, American Masters has earned 28 Emmy Awards - including 10 for Outstanding Non-Fiction Series since 1999 and five for Outstanding Non-Fiction Special - 12 Peabodys, an Oscar, three Grammys, two Producers Guild Awards and many other honors. Now in its 28th season on PBS, the series is a production of THIRTEEN PRODUCTIONS LLC for WNET. WNET is the parent company of THIRTEEN and WLIW21, New York's public television stations, and operator of NJTV. For more than 50 years, THIRTEEN has been a partner with the tri-state community, using its rich resources to inform and inspire the passionate people of New York and the world to better understand and address the issues that challenge our diverse communities. American Masters: Bing Crosby - Rediscovered is a production of THIRTEEN PRODUCTIONS LLC's American Masters for WNET. Robert Trachtenberg is writer, director and producer. Gillian McCarthy is editor. Junko Tsunashima is supervising producer. Julie Sacks is series producer. Susan Lacy and Michael Kantor are executive producers. American Masters is made possible by the Corporation for Public Broadcasting, Rosalind P. Walter, Anne Ray Charitable Trust, Cheryl and Philip Milstein Family, The Blanche & Irving Laurie Foundation, Rolf and Elizabeth Rosenthal, Jack Rudin, The Andre and Elizabeth Kertesz Foundation, Michael & Helen Schaffer Foundation and public television viewers. As New York's flagship public media provider and the parent company of THIRTEEN and WLIW21 and operator of NJTV, WNET brings quality arts, education and public affairs programming to more than 5 million viewers each week. WNET produces and presents such acclaimed PBS series as Nature, Great Performances, American Masters, PBS NewsHour Weekend, Charlie Rose and a range of documentaries, children's programs, and local news and cultural offerings available on air and online. Pioneers in educational programming, WNET has created such groundbreaking series as Get the Math, Oh Noah! and Cyberchase and provides tools for educators that bring compelling content to life in the classroom and at home. WNET highlights the tri-state's unique culture and diverse communities through NYC-ARTS, Reel 13, NJTV News with Mary Alice Williams and MetroFocus, the multi-platform news magazine focusing on the New York region. WNET is also a leader in connecting with viewers on emerging platforms, including the THIRTEEN Explore iPad App where users can stream PBS content for free.